Click here to download the 2013 Sustainability Scan! 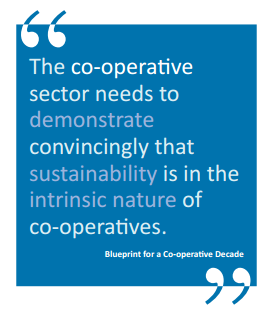 To achieve the International Co-operative Alliance’s vision that co-operatives will be the fastest growing form of enterprise by the year 2020, the authors write that co-operatives need to convincingly demonstrate that the business model makes a positive contribution to sustainability. The Blueprint outlines three areas to make this happen, which include economically, socially and environmentally. Innovations in accounting: the co-operative sector needs to take the lead. There is already a large number of initiatives through which businesses, social enterprises and charities are being encouraged to capture their non-financial performance, such as ‘triple bottom line accounting’ (TBL), ‘balance scorecard approach’, ‘social return on investment’ (SROI),‘social impact reporting’, ‘wellbeing’ measurement. Some of these attempt to convert their various outputs back into monetary terms, as is the case with SROI; governments also do this when seeking to calculate the cost of environmental degradation. Others (such as TBL) simply present rival forms of valuation side by side. Many of these forms of accounting are being developed by those working with profit-oriented businesses, to get them to expand their reporting practices beyond financial data. But co-operatives have much to gain from seizing this agenda, as a means of demonstrating their positive impact. There are some attempts to develop specific co-operative performance measurement tools, but these need expanding. The use of social auditing is important to verify claims about performance. Co-operatives should be leading the field in the development of principles and standards for such audits, as investor-owned businesses have led (and dominate) the development of principles and standards for financial accounting and audit. Case studies: The diversity of co-operative forms and goals is under-recognised. Case studies and first-hand stories showing the contributions of co-operatives to education, communities, health and other public goals are important here and needed. Consumer energy co-operatives are making a crucial contribution towards the shift to a low carbon economy, which needs recording, studying and highlighting. Evidence gathering: In order to demonstrate their contribution to sustainability to public policy-makers, economic analysis of the ‘positive externalities’ of co-operatives is valuable. A number of techniques exist (known as ‘contingent valuation’) for capturing the value of non-market goods, such as health and a clean environment. Consideration should be given to the ICA facilitating the establishment of a virtual data bank. Public advocacy: The message about co-operatives can no longer be limited only to the language of democratic member control. It needs to be broadened and now needs consistently to include a reference to sustainability, so as to attract interest from public policy-makers, the broader public and young people. Technology: The co-operative sector should aim to become leaders in the development and use of technologies and social systems which specifically deliver human benefits, without despoiling the ecosystem. Management Practices: The co-operative sector needs to do more to develop and promote distinctive management practices which reflect the democratic values and long term horizon of the co-operative business model, and which will fully exploit the potential co-operative advantage. Strengthen and Integrate the Co-operative Business Network: The co-operative sector should identify and remove barriers to inter-co-operation, including, where possible, integrating systems, such as procurement, using the principle of subsidiarity.